with part flagstone floor, wainscoting, Rayburn providing solid fuel heating set in a feature fireplace with exposed brick work, fitted floor units and work surface and serving hatch to kitchen. with tiled effect floor, fitted floor and wall units, work surface with sink unit, recesses for white goods, feature wall with stone tiles, window to rear, door to yard. with carpeted floors, two windows facing to front, recess for shelving. with laminate floor and window to rear. with laminate floor, panel bath, low flush WC, window to rear, pedestal hand basin. with laminate floor, windows to front, carpeted floor, recess for shelving. with laminate floor, pedestal hand basin, corner shower cubicle, low flush WC and window to rear. 2 Smallbrook Terrace has a detached garden measuring approximately 7.62m x 6.4m (25' x 21') with two outbuildings including a green house. 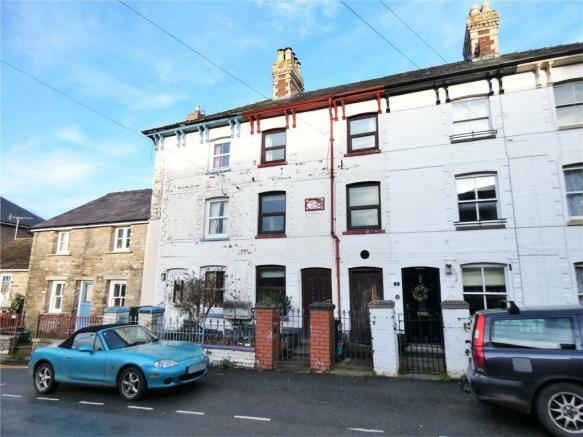 Please note that access is shared between the four terraced houses through the alley way, which then leads to each garden to the individual properties. Disclaimer - Property reference HAY180209. The information displayed about this property comprises a property advertisement. Rightmove.co.uk makes no warranty as to the accuracy or completeness of the advertisement or any linked or associated information, and Rightmove has no control over the content. This property advertisement does not constitute property particulars. The information is provided and maintained by McCartneys LLP, Hay-On-Wye. Please contact the selling agent or developer directly to obtain any information which may be available under the terms of The Energy Performance of Buildings (Certificates and Inspections) (England and Wales) Regulations 2007 or the Home Report if in relation to a residential property in Scotland.